YoYo the dog knows how to have fun without leaving the neighborhood. Granted, the neighborhood is full of interesting things, like swimming pools and tree houses and hippos, but YoYo deserves credit for imagination alone. These colorful books, for toddlers and preschoolers, double the adventure with flaps on each page. When YoYo plays hide-and-seek with the monkeys next door, the flap reveals his tree fort hiding spot with a big “BOO!” When he flies his kite in the park, he also takes time to feed the ducklings on the ground, under the flap. These two books are simple and short, but good for a quick snuggly read before a nap. The perennially happy YoYo learns that sharing is the most fun, and he always wears his bike helmet. The YoYo books are among a number of spring publications from Tiger Tales, a kid-friendly publisher big on color, illustrations, and life lessons. Characters save the day with kindness, with smiles, with family togetherness, all without coming off as too sticky-sweet. Bravery and friendship are always rewarded, endings are always happy, and fun surprises often await the reader. 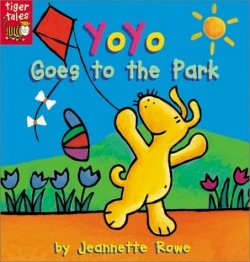 Rowe both writes and illustrates the YoYo books. The dog, the plants, and the toys are outlined in black, giving them a gentle nudge for little eyes. The skies are always blue and the sun, a circle with sticks coming out of it, is always shining. Colors are abundant and there is plenty of action in the illustrations to correspond with the story. When YoYo goes to visit his friend Scooter, who has chickens, a lime green rooster with a blue head perches on Scooter’s head as he gathers the eggs. The pictures on the outside of the ice cream truck, while simplistic, truly look good enough to eat. Young children will relate to the illustrations as if they had drawn them themselves.